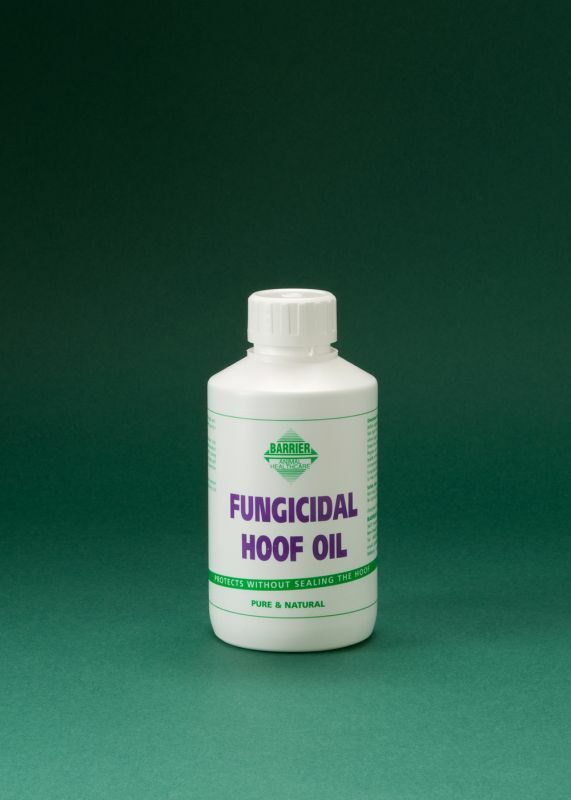 Fungicidal Hoof Oil is an excellent all year round anti-fungal, anti-bacterial lubricant for maintenance of healthy feet, whilst giving a professional high gloss for the show ring. Strengthening Lubricant: Fungicidal Hoof Oil is a fine strengthening lubricant that combined with natural coconut derivatives makes it an ideal product for use on weak, brittle hooves, splits and even sand cracks. Contents: High grade Essential Oils, Natural Oils, Vegetable Oils, Vegetable Emulsifier, Wheatgerm. Dry, brittle hooves : During the summer months Fungicidal Hoof Oil helps guard against dry, brittle, cracked and split hooves. Fungal Conditions: During wetter conditions Fungicidal Hoof Oil acts as a barrier and so helps to protect against fungal and bacterial conditions and smelly frogs. Won't seal the hooves: Protects without sealing the hooves. It helps to maintain the natural moisture balance of healthy hooves by allowing the hooves to breathe.